Previous posts have discussed various papers used in bookarts, but I didn’t see any mention of Saint-Armand papers made in Montreal (Canada). They are one of my favourite papers with wonderful textures and colours, so I thought I would share a little about them with you. The Saint-Armand paper mill manufactures a variety of papers, including handmade and machine-made. The mill was established in 1979 by David Carruthers, who comes from a family associated with paper. I met David Carruthers over 10 years ago at a workshop, and I remember him telling us you could tell the pH of a paper by its taste (yes, with your tongue!) but I haven't developed that skill yet! 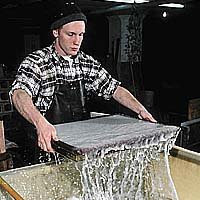 Saint-Armand papers are made from rag pulp rather than paper pulp so it is a “green“ product. They recycle mostly cotton off-cuts from clothing manufacturers and also linen, flax straw, jute and sisal, beating it by machine with a Hollander beater. (Wouldn’t it be great to be able to recycle used clothing at home into paper?) The handmade papers are made one sheet at a time following the same methods we’d use in our home studios. The sheets have 4 deckled edges and no grain direction. The machine made papers are made with the same pulp but on a fourdrinier paper machine. 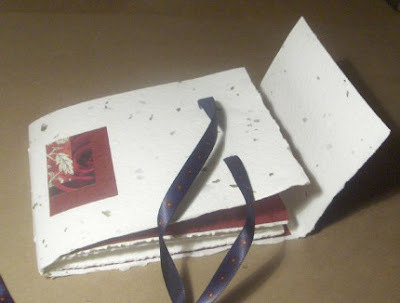 MyHandboundBooks has used a white Saint Armand paper embedded with parsley flakes for the cover of this little sketchbook. 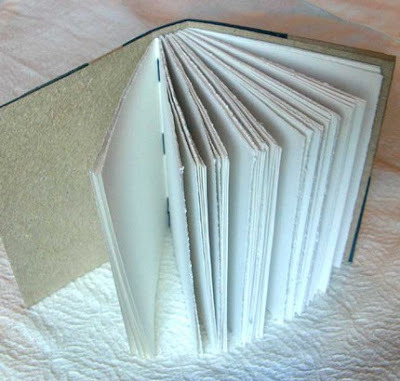 MyHandboundBooks has used Saint Armand paper as a liner for this book. As a book artist, I appreciate the strength and beauty of Saint-Armand papers. Their thicker papers can be used for covers, and they have a lovely selection of thinner papers which would be nice for the pages. 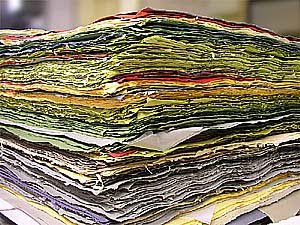 Some of their papers are quite textured including the Umbrella paper. My local retailer made a portfolio from Umbrella paper and has been using it for years. PrairiePeasant has used this paper for a crossed structure binding. The mill does not sell directly to the public, but they deal with many retailers across Canada and the US. I am not aware if their papers are available in other places around the world--perhaps someone else might comment on this. Oh St Armand is marvelous paper! I had a sheet that had flakes of parsley in it, it was beautiful! It's hard to source around here too, though. Thanks for sharing this Laura. Thanks for sharing the photo of the parsley paper Rhonda. I've been quite lucky--my "retailer" in Winnipeg is a home based business, and she has always had a pretty good selection to choose from. I'm a long-time user of St. Armand paper from the days I lived and worked in Montreal, where I first met David Carruthers. I began selling St. Armand paper in Winnipeg 15 yr. ago and can't seem to stop. I keep the Canal paper and many of the decorative papers in stock. Email me - Papermakerschoice@mts.net - if you'd like a price list.